Sunday lunch was a big deal when I was growing up. Sunday was a real family day. It was before Sunday trading laws changed so my day usually consisted of church, a Sunday roast then afternoon tea in front of the Muppet Show. I look back at those restful days with nostalgia and was delighted to learn that Jack's Kitchen, based on the ground floor of the riverside Holiday Inn in Kingston South (near Surbiton), Surrey aims to revive the popularity of a that truly British meal in carvery style with one added bonus - an unlimited hour of selected cocktails included in the price! Yep - £27 for three courses AND unlimited cocktails (you can choose Whiskey Sours or Bloody Marys) for one hour. And we got to enjoy all of this in a beautiful room with a pianist tinkling away in the background. Now if I had to choose a last meal I would be torn between a carvery roast and a good steak. There would most definitely be cocktails. Arriving at Jack's Kitchen with my companion from EatCookExplore I was slightly surprised to realise the cocktail hour was incorporated into the meal time. I think they are missing a trick there as a relaxed cocktail hour before lunch would almost certainly put me in the right mood for a bottle of wine with my food and we all know where restaurants generally make a big chunk of profit right? Yes - with the wine! 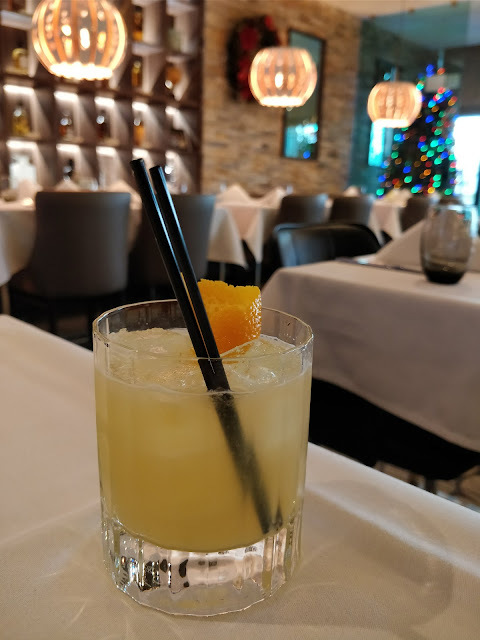 Anyway, I was happy to drink Whisky Sours with my lunch (I could have ordered a Bloody Mary but that is pretty much the one cocktail I don't like). My first one was properly sour but the helpful waiter was happy to return it and get me a new one. Meanwhile we had spotted the other rather unique attraction at Jack's Kitchen. 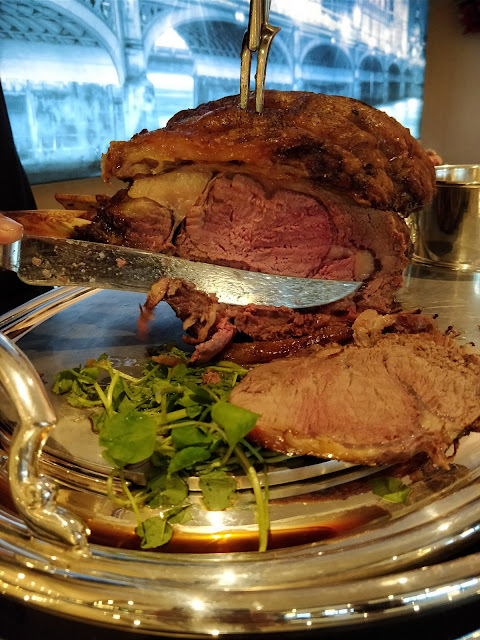 A beautifully restored vintage carvery trolley loaded with a giant lump of dry aged locally sourced Surrey rib of beef which looked absolutely beautifully cooked. There was a range of interesting starters showcasing the talents of Head Chef Akshay Sabharwal who often fuses Asian flavours with traditional British ingredients to good effect. The cumin infused butter with sourdough bread we nibbled while browsing the menu was a particular triumph. 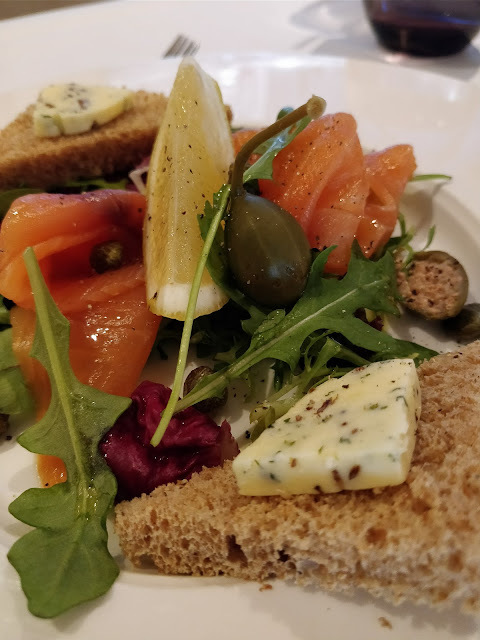 The salmon was plentiful, capers delicious and the dish was only let down by the lumps of butter on my bread - either spread it properly or serve it on the side she says sternly! 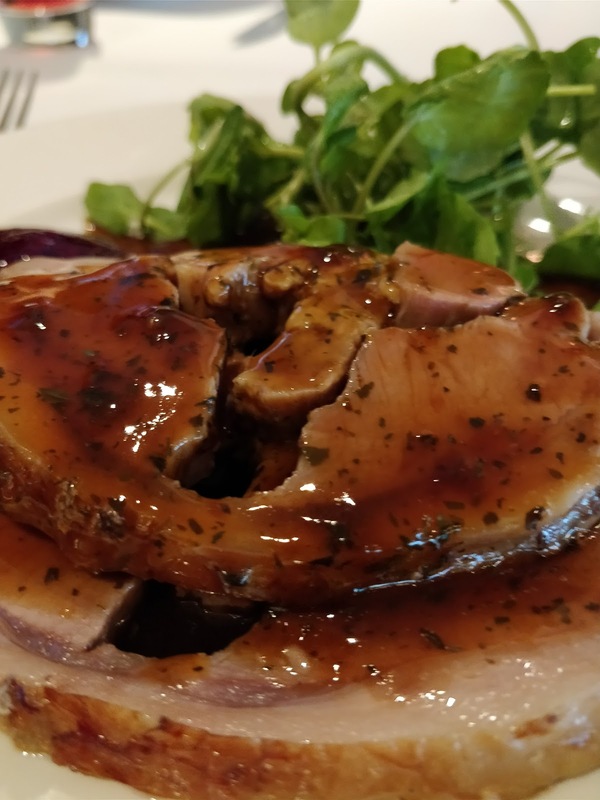 For the main course during my visit I could choose the aforementioned beef, Welsh stuffed saddle of lamb, farm roasted turkey, pan fried Scottish salmon with creme fraiche, Champagne and dill sauce or there was a charred mediterranean vegetable risotto with a roasted pepper coulis. You can mix and match two meats but as we were reviewing we were allowed to try a taste of all of them. 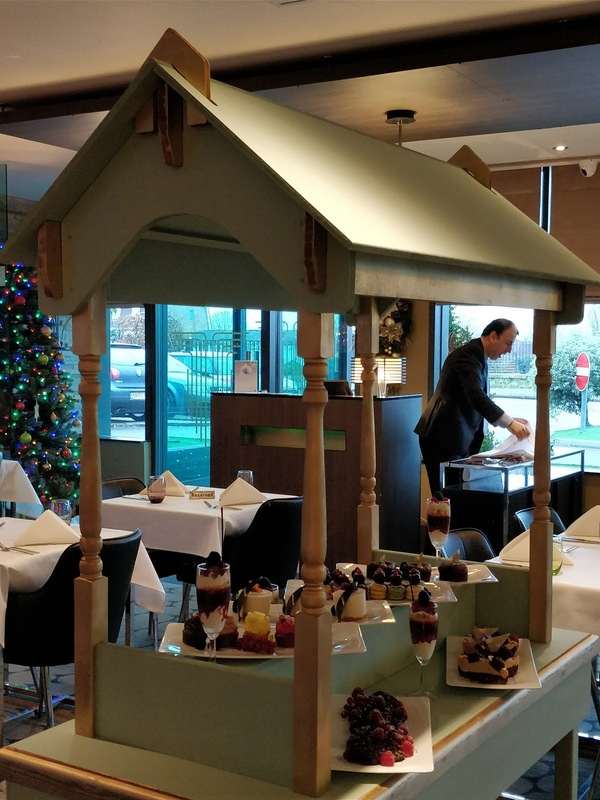 The beef is carved and served at table from the fabulous trolley and other dishes are served plated from the kitchen. I would highly recommend the beef although the lamb too (pictured below) was delicious. The turkey was a little dry for my taste if I am honest. All meats came with the sauces you would expect and the beef was accompanied by a delicious merlot jus. Be sure to say when ordering if you would prefer gravy on the side rather than already on the food. 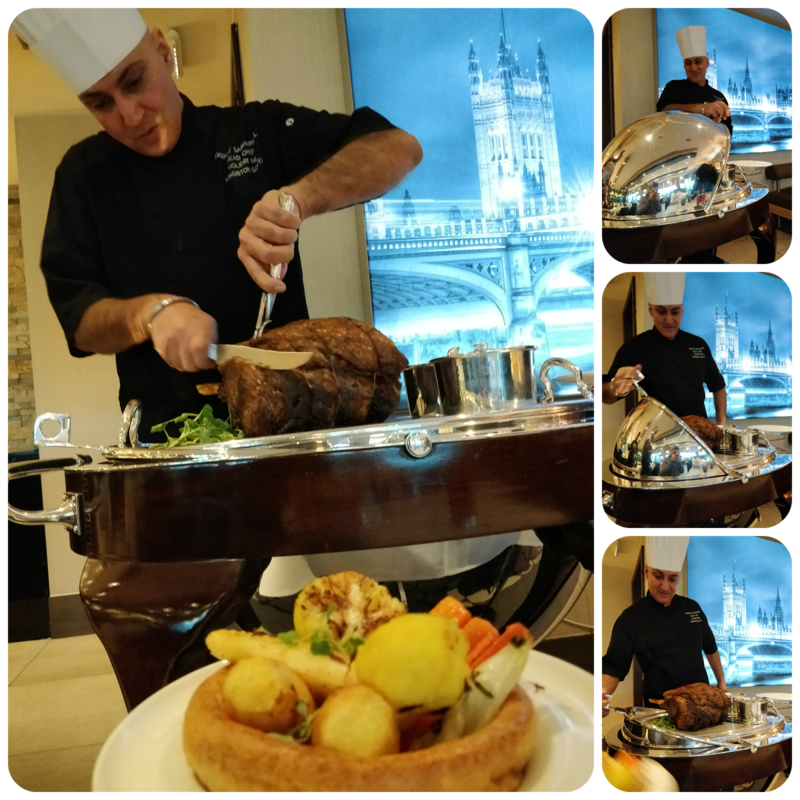 Meat portions were generous and were served alongside roasted British farm vegetables and goose fat roasted potatoes with rosemary and garlic in a giant Yorkshire pudding bowl. Dessert is an eat as much as you like extravaganza served from a novelty cart in the centre of the restaurant although I doubt many people would be able to eat much after such generous portions in the previous two courses. 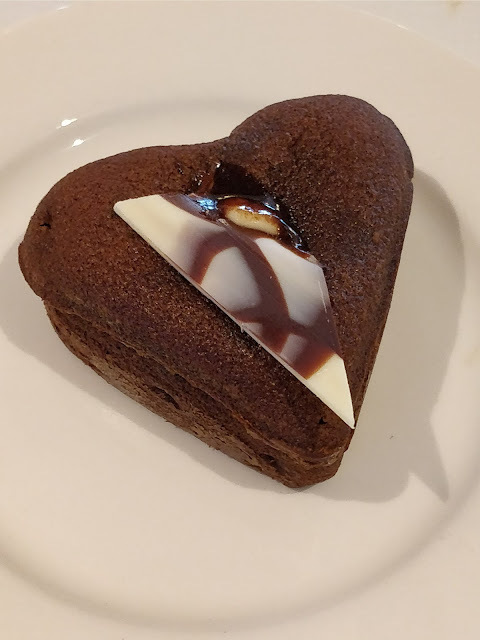 I chose a chocolate fondant heart which was warmed for me- it was delicious. I also tried a macaron which the kitchen had adorned with a chocolate cream filled shell topped with a redcurrant. 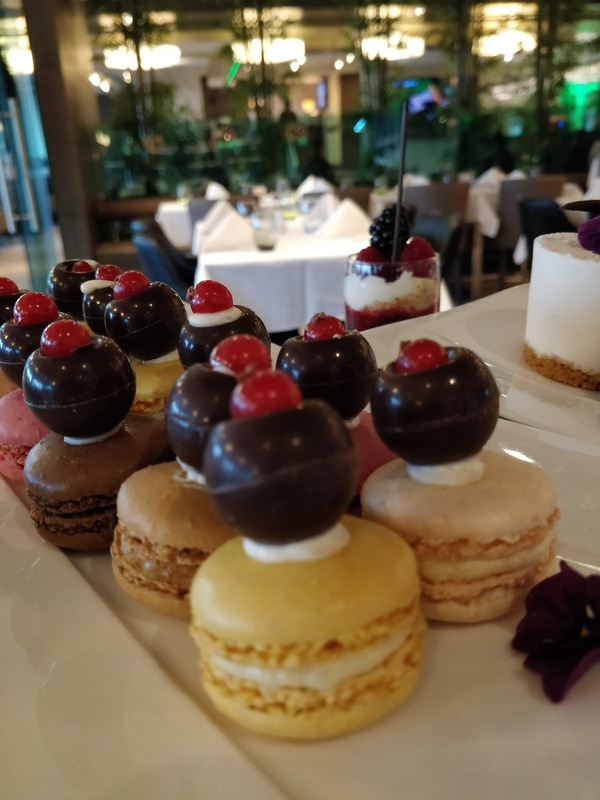 There was some mix up with the waiter incorrectly identifying some of the deserts but after pointing this out the management assured us that they would take our feedback on board in relation to the danger of not highlighting and minimising potential risks for those with allergies. Slight niggles aside it was still a lovely lunch in a nice room with a relaxing nostalgic atmosphere. 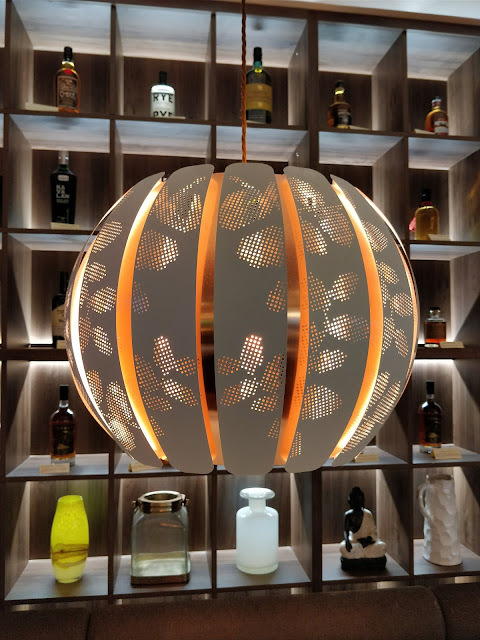 I particularly liked the table settings on white starched tablecloths which gave the place a high end feel and the whisky wall which was nice feature. The pianist was a real highlight and we were delighted to discover he took requests. He even agreed to play Abba songs for me. Apologies to the other diners who might not share my taste in music but it was definitely nostalgic for me! At £27 for three courses and unlimited cocktails for one hour you certainly cannot complain about value for money, especially since the restaurant is just a short ride out of central London. The Holiday Inn Kingston South is a short walk ( or an even shorter taxi ride) from both Surbiton and Thames Ditton stations, Jack’s Kitchen is situated in the Holiday Inn Kingston South, commanding an enviable view of the Old Father Thames which separates it from the grounds of majestic Hampton Court Palace. I reckon as word spreads this deal could become extremely popular so book now to avoid missing out. Disclaimer: I enjoyed the 3 course carvery meal with cocktails as a guest of Jack's Kitchen for the purpose of this honest review.